Sitting on the banks of Sinanishko Lake, at 7216 ft (2200 m) above sea level, is Sinanitsa Hut. Sinanitsa Hut is a massive 2-story structure that was built in 1979. 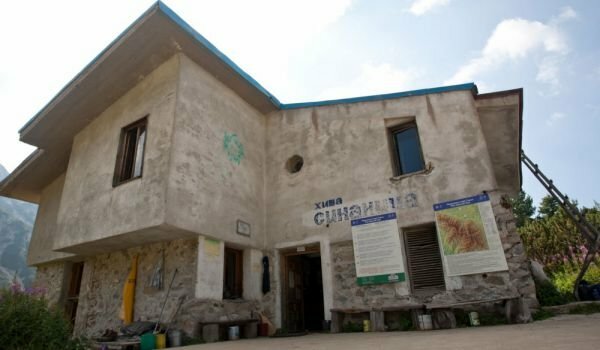 The strategic location of Sinanitsa Hut makes it easy to organize hikes to the southwestern part of Northern Pirin in any season. The nearby peaks Sinanitsa and Momin Vruh, located southwest of it, offer wonderful mountain climbing opportunities. Sinanitsa Hut has a capacity of 50 beds distributed into 10 dormitories and room for 20 in tents during summer. There is a tourists' kitchen, a large dining room, electricity and running water, a bathroom and warm water. During summer, it has a radio link with the town of Kresna, Kamenitsa Hut and Yane Sandanski Hut. Sinanitsa Hut can be reached in 6 hours by road (about 15 mi (24 km)) or in 3 hours by a well-defined forest trail along the left bank of Sinanishka River. Telephone: 0743 3 45 47; 0743 3 22 40; 0888 210 180.